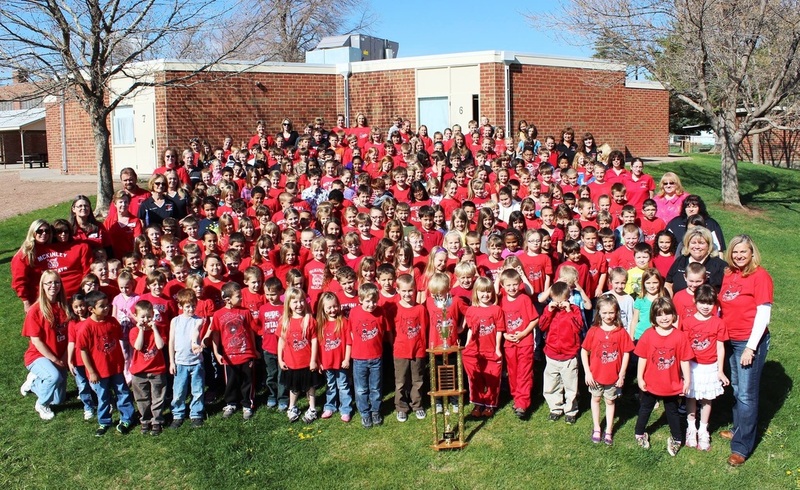 McKinley Elementary School student body and staff members. Damien Torres-Montoya and CCHS principal Bret Meuli discuss his guitar project at a board of education meeting. I want to first commend the McKinley Elementary School staff upon receiving their mid-year building evaluation rating last week. Many may know McKinley earned a Turnaround rating through Colorado’s accreditation process back in 2012 (the lowest possible school rating) and since then have grown their rating to Priority Improvement (as of 2014). Unfortunately, because of a change in state assessment processes schools were not able to earn a new accreditation rating in 2015. However, based on our mid-year evaluation of the school’s processes and student achievement results, and with the guidance of an outside expert, we can confidently say McKinley would at least have grown their rating one more step to Improvement, and very possibly even to Performing. Principal Drenda Manning and her staff deserve a lot of credit for the hard work they are doing to improve learning outcomes at McKinley Elementary School and for being willing to open their building up to such an evaluation process! I want to thank Cañon City High School student Damien Torres Montoya for being kind enough to come to a board meeting to share an electric guitar he made from scratch at CCHS. Mr. Montoya crafted this piece in his career and technology trades class. This is a fine example of one of our students having the opportunity to apply skills learned to a real life problem, and in an area of personal interest. Enjoy playing that beautiful guitar Damien! I want to recognize Carrie Hannenberg and Pat Stott for the wonderful staff development instruction they have been offering too staff members on the Colorado Active Learning Project. Their work is helping our teachers to understand the value of implementing brain boosting activities in all classrooms in support student health and wellness, and to increase learning outcomes. Thank you ladies for putting your heart and soul into this fine work. I hear great things about it! I would also like to congratulate our nine Cañon City High School wrestlers who competed in this year's state wrestling tournament. Freshman J.W. Ruona and Senior Nick Snyder took 3rd place, while Lucas Bufmack earned 5th place honors. Along with Zac Hanenberg, Zeon Ortega, Bailey McBride, Xavier Byrne, Tucker Coffey, and Tucker McDowell, these fine young men represented our entire community well. Congratulations men! Finally, I attended an outstanding presentation at Cañon City High School last week about a concept to create a tutoring center for students. This was put together by teacher on special assignment Scott Morton and assistant principal Toby Melster after visiting districts who are implementing similar models. The idea is driven by concerns we have related to many of our freshmen failing key academic classes each year. Their proposal would create a freshman class schedule requiring one of their block periods to be broken in half so every student could be offered an academic focus class guided by a certified teacher to support them in developing effective study and organizational habits, as well as with general academic support, and possibly even career guidance through an ICAP process. The other half of this block would be taken up by a 45 minute length 1/4 elective course that would last a whole semester. Additionally, when academic focus teachers identify students falling behind in particular content they would be able to refer those kids to a tutoring center staffed by content specialists and trained students who would support their needs. I know there are many root causes we need to address related to the overall success rate of Freshmen students at CCHS, but I was extremely impressed by this proposal and have encouraged the administration to seek staff support for implementing it. If we move forward we will write the concept into our Expelled and At-Risk Student Support grant application to help put it, or a more refined proposal, into practice. Much of my work life has been consumed by an effort to submit a comprehensive Building Excellent Schools Today grant application to CDE by the end of February. In working through this process district staff and a few board members have taken the good work begun with the completion of a comprehensive facilities master plan back in 2012 and moved forward with it. Many folks might recall our original master plan led to a decision to close and put up for sale the Garden Park alternative high school, and to move the Cañon Exploratory School model from our old Madison facility (which was then sold also) to Skyline Elementary. This resulted in more efficient use and maintenance of facilities. The master plan also developed a comprehensive list of improvement needs related to roofing, water delivery, and general school safety issues. Since 2012 the district has acted on many of the original needs identified, but has really struggled to do so just by using annual operations dollars. Former superintendent of schools Dr. Robin Gooldy, director of finance Buddy Lambrecht and transportation and facilities manager Jeff Peterson have simply done amazing work in the past few years securing small BEST grants to support this work, and by wisely spending district operations dollars to tackle some major needs. A bond question placed in front of the community in November 2013 would have helped address many more of these issues, but it failed by around 300 votes. Our original intent to secure a large scale BEST grant was to knock out the rest of our major facilities maintenance and safety needs. This would have required us to bring a funding question to the community to cover our matching portion of the grant. After repricing everything needed the cost came to 10.5 million dollars, 35% of which we would have had to match locally if we got the grant. I think this would have been doable, but two serious concerns arose as a result of our process. First, a need to do a structural analysis of Washington Elementary School became apparent, and then a tremendously large dollar figure related to getting CCMS fully maintained. As a result of this Buddy, Jeff, and I have decided to recommend to the board of education that we pursue a much smaller grant application this year that would address many of our pressing roofing needs, and create more secure school entries and communications systems at McKinley, CES, Lincoln, Harrison, and CCHS. The price tag for these proposed improvements will be just under 1.3 million dollars, $415,000 of which we would have to match out of our budget. If approved by the board of education, and by the BEST board, we would allocate half of our $415,000 match over each of the next two fiscal years. In the mean time we would then conduct a structural analysis of Washington Elementary so we can get a better understanding of what really needs to be done to bring it up to full safe use, while also holding discussions as to how to get the most efficient use out of the CCMS facility before going back to the drawing board to craft a more comprehensive proposal that could take care of the roughly 9 million dollars worth of needs remaining. On one other major front director of student services Nick Carochi and school psychologist Jamie Murray have been doing great work mapping out a general concept for an Early Literacy Grant application we intend to submit to CDE. In doing so they are working to secure a strong core reading resource for use by all elementary schools and are looking to add a strong literacy intervention program. I am excited about this work and very much value the what they are doing. Director of Student Services Dominic Carochi attends a meeting about updated federal education legislation. Though it was President’s Day and Winter Break, I was in the office for a bit on Monday and Tuesday to work on BEST grant writing tasks and to complete mid-year principal evaluation rubrics. On Wednesday I presented our evaluation calculator to staff members at CES and Lincoln and I also went to Fountain for a meeting about the updated federal education law with staff representatives from Senator Michael Bennet’s office, along with director of students serviced Dominic Carochi. On Thursday I met with DHS director Steve Clifton about general matters, presented our evaluation calculator to staff members at CCMS and Harrison, held a principal mid-year evaluation session and attended a Facilities Corporation board meeting that evening. Friday was spent in a principal evaluation session and budgeting sessions related to final BEST grant application and capital improvement fund recommendations. Board Secretary Mary-Kay Evans helps a student with site words. This week I will participate in reviewing some language arts curriculum items and attend the monthly Southern Superintendents meeting in Pueblo on Monday morning. I have several principal evaluation meetings sprinkled throughout the week, will attend a Leadership Team meeting on Tuesday, and will officially submit our BEST grant to CDE by Friday. I will also present how to use our evaluation calculator at McKinley and Washington staff by end of day Wednesday and will end my week by attending the CASB Legislative Conference in Denver on Thursday and Friday with board secretary Mark-Kay Evans. Thanks for listening once again! Have a wonderful week!